It's been a long two weeks! The annual yART sale (art in the Yard) was held over the Labor Day weekend, here in Bethany Beach. I had made my lists, checked them twice, then checked them twice again, and packed the car. Many people don't realize that it takes two or more hours to set up for a show. Erecting the canopy, setting up the display racks and screens, arranging the art, making sure everything is labeled and priced, it is all a LOT of work. The big trade shows that folflow conventions will take longer, since their booths are much more complex, but for a local art show, two to three hours is about right. And having help, especially help that can take direction, makes the job shorter and simpler. And having a plan in one's mind makes it that much simpler. And, Trust Me, a show that opens at 10 always has people wandering through an hour early. We were fortunate to be able to erect the canopies the day before -- took a good hour off our set-up time on Saturday morning. And we were blessed with beautiful weather! Warm and breezy on Saturday, and definitely hotter and more humid on Sunday! By the time we were breaking down the show, all of us were wilting. The yART Show is small, as shows go, limited by the size of the courtyard of the private home where we set up. There was face-painting and art for the kids, music, lemonade and Boy Scout popcorn for everyone. No one asked me to tango (can't imagine why . . .) but the music was fabuwous. Outdoor shows are always iffy -- we are so dependent on the vagaries and whims of the weather. Being near the ocean does allow us a modicum of cooler air, but it always depends on which way the wind is blowing. Since the last show, I have added watercolor sketch-books, journals, a new line of notecards, glicee prints, and NEW WORK. I'm attaching photos to give you an idea of where Artistic License is taking me. This one is Five Condos. 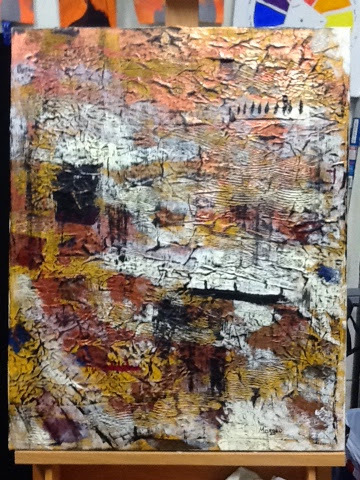 It's 24x30", and you can see some of the collage underneath the color. This second one is North Sea, same size as Five Condos, but a portrait format, rather than landscape. I have finally gotten everything unpacked and back into the studio. And I have been laboring to put things away. Don't remember whose Law or Paradox this is, but "things expand to take up the available space." And the studio looks like it! New projects and canvases seem to proliferate at night, when no one is looking. And, I SWEAR Hub is lurking, and looking at shiny pretties. Summer is the biggest season for outdoor art shows; yART was the only show I did this summer. I have to honestly say, I don't know how artists manage when many shows involve travel and back-to-back weekends. I know how tired I was with just one show! As artists, we tend to work in the solitude of our studios and sketchbooks. A show, especially one as welcoming as yART, is an opportunity many artists need, to visit with people and get feedback. True, we tend to listen to the little voices in our heads, but occasional reality checks (especially from children) can send us in new directions. And I've got a bunch of new ideas fermenting. Well, i'm counting down to a short week until the Big Labor Day Extravaganza known as yART - a two day art show in Bethany Beach. It's been a number of years (at least 5) since my last outdoor show, and to say I'm a little anxious might be a bit of an understatement. It's not that I am really anxious, it's just that i don't want to forget anything! You know the feeling -- going on vacation and forgetting your clothes, arriving at work still wearing your bunny slippers, forgetting where you've parked when you have three half-gallons of icecream in the cart. My anxiety is not about the big things -- canopy, screens, art. It's the Little Things, that proverbial 10% of your work that takes 90% of your time. Do I have pens? receipts? lunch? To digress a moment, we have a resident puka, Hub. For those of you not in-the-know, pukas, also known as pukkas, are alternate-reality beings who can slip in and out of our dimension, easy-as-pie. Sometimes known for their mischievous qualities, they find shiny things, like marbles, keys, coins, jewelry, to be Very Attractive. Let's just say, if you find your keys misplaced, an earring suddenly gone from where you left it, or if you have lost one or more of your marbles, you probably, in all likelihood, have a puka. The most famous puka, Puck of A Midsummer Night's Dream, is who we think of first. But not all pukas are as human-friendly as Puck. They respond favorably to milk, sweets and respect. I'm not sure about chocolate, but what is there to not like about chocolate? Anyway, we have a puka. And, Hub is partially responsible for my anxiety. I mean, what would he find so appealing about a caulk gun? A roll of velcro? A receipt book? Suffice it to say, after asking nicely (many times) and gifts of marbles, I have successfully negotiated an exchange. Caulk gun? Check. Velcro? Check. Receipt book? Double-check. I shudder to think what other found items he has, squirrelled away on the shelves of his room, that I have not yet missed. But, it is very important for me to stay on his good side. So, i'll leave him some cream in a saucer tonight, before I go to bed. And possibly a cookie. And, by the way, I do really have copious lists of things to find and do, before next Friday. But, I hope to see YOU on Saturday or Sunday!! Yes, it's been a while since I last posted. There is news! The annual yART (yard + art) show will be held from 9-3 on Saturday and Sunday, August 30 and 31, at 33258 Kent Avenue in Bethany Beach (it's just South of the Library). I couldn't download the flyer, but it is a great opportunity to see local fine artists who create works in glass, oil, photography, acrylics (that's ME! ), jewelry, soapworks, metalcraft, clothing and other fine arts. I will be showing my birdhouses and new work in flowers, abstract seascapes,and figurative paintings. I'll also have giclee prints, notecards and a few other neat things for sale. And, this show has taken a lot of work to get together. You know, spending time in the studio, creating, mixing, collaging, is where I get my energy recharged. The ability to simply BE in space, allowing the mind to play with "what if?" is exhilarating. Unfortunately, I can't really say the same thing about the labor in getting ready for a show. Lists, lists, lists. Do I have this? Is everything priced? Are things bagged? Do I have bags? Do I have receipts? Pens? Change? Lunch? On, and On, and On. Luckily, most of the paintings were done by mid-June. It's the other 10 percent that's taking so much time! That, and changing my mind (which a lady is allowed to do! As often as necessary!). the yART show is important to me for three reasons: first, it's an opportunity for me to see old friends who know the value and JOY of creating; second, I was invited. Yep! this show is by invitation-only for the artists, and I was INVITED! (What an ego-boost THAT is!) And, third, tho' not necessarily third in a priority sense, the Chinese auction will benefit the Bethany Beach Volunteer Fire Company. Those of us who live full-time in resort communities know how important it is to have a strong Fire Company, especially during the major resort season. And the fact that they are a Volunteer Company, adds to the drama. They pay the same amount for a fire truck, a breathing apparatus, an ax, as do the bigger companies in the cities, where tax monies are available to support their expenses. Our Volunteer companies face a bigger challenge -- they do not have the same access to greater government funding, and the members all have other jobs and careers that they willing set aside to answer the call. These men and women are SUPER. They care. It doesn't matter if you live here or are passing through. They come when called. For the past week I have been awakened at 4 ayem by the sounds of a Catathalon taking place downstairs. The two cats are young, and full of spit and vinegar. Perhaps, because they sleep all day, they are most active at night. Or the other way around. Regardless, they are having a great time. Events include wrastllin', obstacle course, races, high jump, slithering, ball-chasing and stair leaping. Oh, I almost forgot the all-important box-thumping. But, best of all, it's done in the dark. We humans call this awakening in the middle of the night by other names. My husband's favorite expression is "The Syndromes." We all have the Syndromes -- those niggling little worries that creep up on us when we least expect them. We rewrite dialog ("I should have said . . ."), worry about paying bills, meeting deadlines, where is (person, thing), and anything else that comes down the pike. As artists we worry about color, line, 'what's that supposed to say? ", the next show, framing, "But does he/she LIKE it? ", and how do I . . . .
Cats have the right attitude. when they feel the need, they get up and DO something. A Catathalon. Eating. Litter box. Turn over. Cuddle. Watch the critters at the bird feeders at night. We, on the other hand, simply lie there, consumed by . . . whatever. And by the instructions given us as children, "Stay in bed until it's time to get up." So, we stay in bed because we have been programmed to. Would it not be better to do something more constructive? Clean out closets and drawers? Sketch? Write? Read? Do something active that requires us to think about what we're doning? One thing is for certain -- we'll be just as tired in the morning from lying in bed and fretting as we would if we got up and did something. I, for one, have very well-organized closets and drawers. It's all a matter of Cattitude. As I approach my "senior" years, I find myself more willing to be a spectator, rather than a participant. Particularly when it comes to running, jumping and other forms of quick physical activity, I find that my "jumper" just doesn't work as well as it used to. Be that as it may, I still walk and move about (herding cats requires that one be reasonably agile and able to react quickly). If you've been off-planet for the last several weeks, you may be surprised that the summer sports schedule has been taken over by something called "World Cup." What 6 million of us call "soccer" and 6 BILLION call "football" (or futbol), entails running. Lots. And a huge amount of foot/eye coordination. And they are done at the same time. Thirty-two countries send national teams to the World Cup, although all nations are eligible to participate in the qualifying matches. World Cup is, quite simply, the best of the best players in the world, competing to see which team is the best. Each player, aside from the goal-keepers, expect to run an average of 8 miles in each match. That's RUN. And sprint, saunter, walk and jump for 90+ minutes. There are no time-outs, except for injury on the pitch; there is one 15-minute break between two 45-minute halves. Think these players are in shape? You'd better believe it. There are no refrigerators or potatoes on the field. Every single player is in tip-top shape, and (from my point of view) easy on the eye. Speed, grace, agility, and beatuiful athleticism. Where I'm going is simple. These Best of the Best did not get there simply by showing up one day, saying "I'm the best." They have been playing since they were 7, 8, 10 years old. They have been educating their bodies in special skills to develop vision, coordination, strength, endurance. They'be been educating their minds on plays, theories, memory and planning. And, they've been doing it daily. For absolute YEARS. The theory is simple -- practice, practice, PRACTICE. It works for everything we do. Certainly, there are savants and geniuses who appear to have sprung from their mothers' wombs able to compose symphonies. But for the rest of us, we get where we want to go by practice. By doing it regularly, consistently and with the mind-set that we need to perform the "darned dailies" in order to develop that inate sense of what works. It's knowing when the time is right, when the line is right, when the flavor is right, when the presentation is right. We've done it enough times that the piece is "done." Same way with what I do in the studio. There are voila moments, sure, but mostly art is done the same way cooking, investing, bridge-building, negotiating, and driving are done -- practice, practice, practice. There is no magic incantation except "let's do another one." No magic wand except a paint brush or a pencil. No time machine that gets us to the end of the hallway instantly. We get there by walking, by doing, by being in the present moment and by being aware of wht is going on. It's a different kind of magic! Much has been going on in the few weeks since I last blogged. Spring has landed, although with fits and spurts. Heat on, air conditioning on, windows open, windows closed, fire in the fireplace -- one of the joys of Spring is that the weather is truly unpredictable. So, too, is life. Spring cleaning, both out in the yard and in the buildings, moving furniture, herding cats and husband, and taking care of a myriad of 'darned dailies' that seem to have minds of their own, the last few weeks have been hectic. There are times I wish my fairy godmother would swoop in and take care of some of this stuff. Included, of course, is the 'stuff' of making art. Not just painting, but photographing, recording, framing, ordering supplies, and even varnishing paintings seem to take time away from applying brush to canvas. But in the whirl and rush of the Spring dust storm, I have been able to finish 15 paintings in the Birdhouse series and one in a new series. These new Birdhouses are smaller, ranging from 8x10" to 12x16", and they are all framed and ready to hang. The new series is larger works on gallery-wrap canvas, "Ships Passing." The first one, "Two Ships Passing in the Night," is shown below. But what I am truly excited about is this: I have been invited to participate in the yART Show this coming Labor Day weekend. I have been attending the yART (ART in the yard) Show over the last 7 years. It is held at a private residence on Kent Avenue in Bethany Beach, and is by invitation-only. So, just ask me how excited I am to be invited! 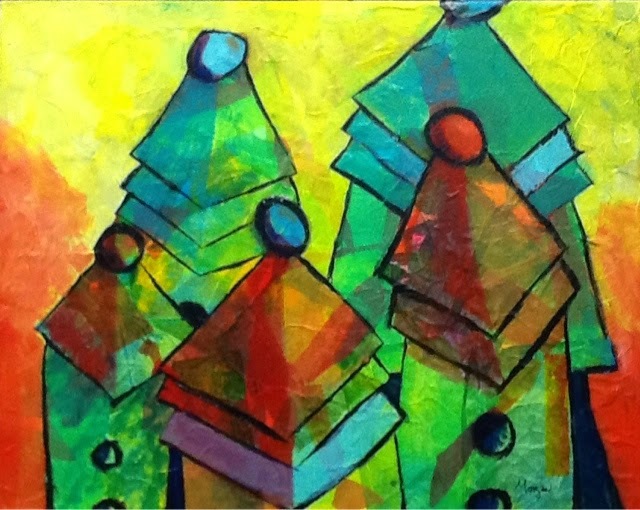 Upwards of 20 artists gather from 9-3 on the Saturday and Sunday of the holiday weekend. Works range from fine art to blown glass, wood and metal smithing, jewelry and photography. There's music, snacks, face painting for the little (and big) ones, and this year, for the Very First Time -- ME! You'll definitely be hearing more about this as the summer progresses, but if you plan on being in the Bethany area over Labor Day weekend, you'd BETTER stop by and see me! I'll be the tall, slightly crazed artist surrounded by Birdhouses! Wednesday this past week was a bright, shiny and windy day. The Plein Air Painters of the Mid-Atlantic (PAPMA) met for their first plein air day this year. Seven of us gathered in the Circle, in Georgetown, DE. Many historic buildings, as well as the County Courthouse, border the Circle. While the breeze was rather lazy (it blew right through us, rather than going around us), we were all able to chatter and paint and admire each other's work -- oils, watercolors and sketches. I received questions about my watercolor sketches. This one is the Brick Hotel, on West Market Street. 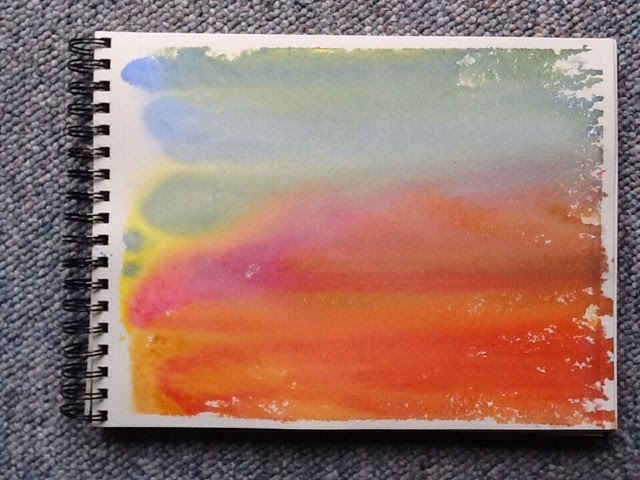 It was painted in a 9x12" watercolor journal, so the paper is 140# -- capable of handling a strong wash. The paper had been given a watercolor wash in the studio, prior to my going to Georgetown. The first photo shows what the sheets look like before I begin the sketching. I use three cool colors -- they are 'atmospheric' and allow more of a feeling of unity throughout the sketch. As you can see from the photo, there appears to be a border around the edges. I taped the page to a backing to prevent the paint from bleeding around the edge of the paper and to allow the paint to run off. Because I am using a very wet technique, I don't want the color to puddle on the paper or the paper to buckle with the water. I apply all three colors at the same time, so they have a chance to blend on their own, without using a brush to manipulate paint. This first sheet has cobalt blue, quinacridone rose and a yellow azo. The air around us has a cool glow to it, so I used cool colors to give a sense of what the day was like. 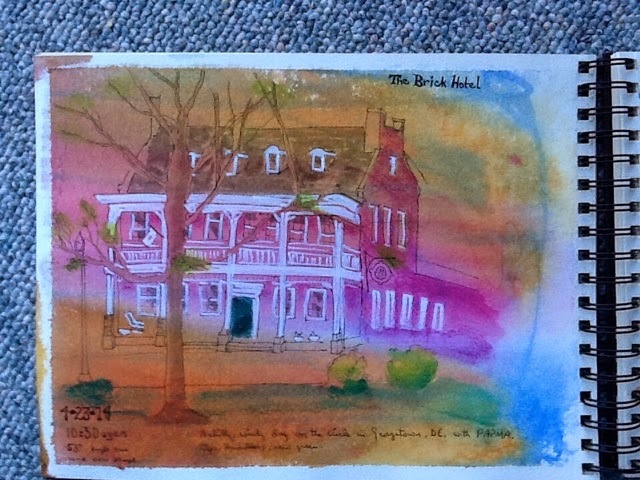 The second photo shows the Brick Hotel, but I had used a quinacridone gold, a warmer color than the yellow azo. I keep several of these prepped sheets in my sketchbook, "just in case." Once the pages are prepped and dry, they are portable, and ready to use. And, the bonus is that I don't have to wait for a wash to dry before I begin sketching. Once the sketch is done, I can go back in with other colors enhance the drawing and be done, with a minimum of color mixing on site. This technique does require some pre-planning, in studio, particularly. "Waiting for paint to dry" is an apt expression! And since the book is in a landscape format, I know essentially where I want the main bodies of color to be. I had coffee with a dear friend yesterday, and she asked me when I paint. She wanted to know if I had a schedule, a routine, an appointment with myself. I realized when I got home that I had answered her question in an opposite. I told her when I did not paint, but not when I did. This is a fairly common question that artists get asked. I think it relates to The Muse. Before I started painting on a regular basis, I assumed that artists waited until the Muse spoke. Then they went into their studios and created masterpieces. Such was the way Talent worked. Once I started interacting with other artists on a regular basis, taking lessons, reading and studying, the realization hit (along with a lot of comments from other artists) that the Muse was pretty much a figment of someone's imagination. Art -- painting, sculpting, drawing, etching, etc. -- is something that requires practice. The only way to become a good artist (or musician, or social worker, or physician) is to practice. It takes time, and energy, effort, bad starts and mistakes, and more time to become good at anything, be it riding a bicycle or singing the blues. So, Linda, here's the answer to your question. I prefer to paint in the morning, the earlier, the better. I am quite willing to be in the studio-io at 7 ayem. I am a morning person, you see, and am usually too brain-tired and physically tired to paint in the evening. While I can be a very disciplined person, I find, at this stage of my life, a daily routine is almost impossible. There are just too many mental and physical distractions -- cats needing attention and food, spouse needing attention and food, laundry, bills, yard work, house work, and a whole plethora of darned dailies that intrude into my plans. I'd love to say (with a noble and snobbish attitude) that I paint every day. I don't. But it's not for waiting for the Muse to speak; just too much static from the voices in my head that say, "Oh, don't forget the milk and butter, and laundry, and that boxwood needs to be pruned before the mulch gets delivered." The "shoulds" yell the loudest, and take precedence over the wants. That is my reality. I still get to the studio, though. It's just not by appointment or schedule. And I do make a conscientious effort to get int the studio at least 3 times a week. But yesterday was different. I gave myself the day off and went to the beach. My goal was to sketch. And I did! Having the goal of sketching (or painting, or messing about in the studio-io) is what I aim for -- not to complete a painting, or make a beautiful sketch, or impress the buttons off my jacket. But just to create. To paint. To draw. To say "What If?" And, speaking of "what if? 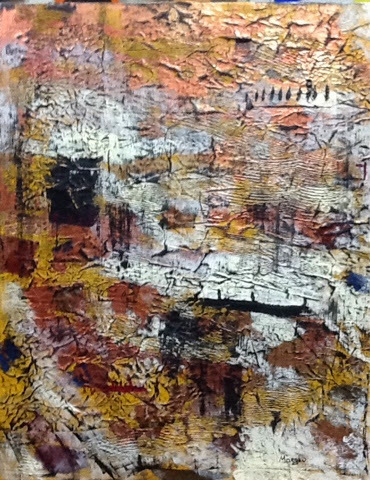 ", I entered the Mispillion Art League's Annual juried and judged Spring Members' Show two weeks ago. Over 90 paintings, photographs and three-dimensional works were entered, and they had space for 60. I was pleased that all three of my works, two acrylics and one oil pastel, were accepted. And really surprised when Daylight in the Swamp was awarded a First Prize. 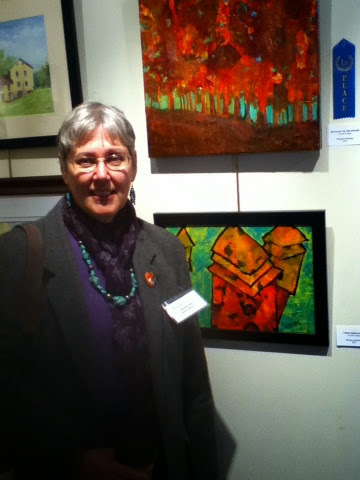 Here is a photo of me and the blue ribbon painting. 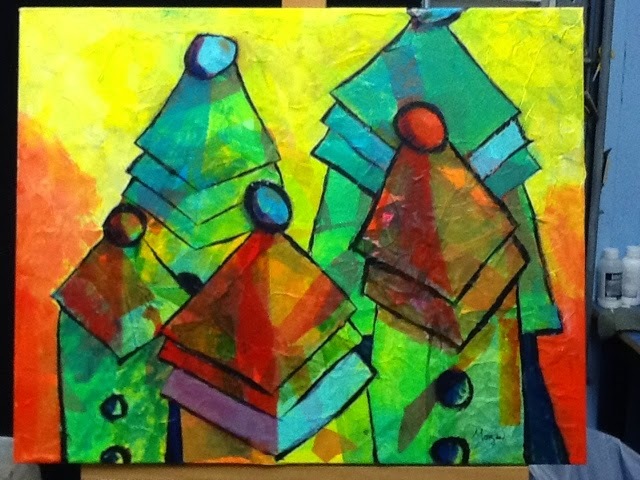 And, the one below it, Three Birdhouses, is my other acrylic. Pretty cool, huh? Today I drove to Milford, DE, a small town about 35 miles north of here. The trip takes about 50 minutes, due to all the small towns we need to drive through to get there. Milford is a pretty little town, with a growing and vibrant down-town, a festival, parades, glleries, a play-house, library, and, best of all, the Mispillion Art League. This spring, from April 1 to May 30, Mispillion Art League is showing their annual Spring Juried/Judged show, "Creativity Springs." Of course, I entered. Jurying and judging is tomorrow, so I won't know if I've been juried in until tomorrow evening. And, from glancing at the other work dropped off this morning, it's gonna be a GREAT SHOW! I always combine my trips to Milford with taking care of errands along the way, and LUNCH, preferably with a fellow artiste! Today's lunch was scrumptious! We brunched at Abbott's Grill, with an array of fruit, desserts, breakfast and lunch items, including Red Velvet pancakes, hash browns, two types of egg dishes (and custom omelets), bacon, scrapple, sausage, salads, and cheese blintzes. When we finally waddled away from the table, my friend, Rosemary, and I turned up at the dessert bar, and sketched. This was the best part -- Rosemary sketched the desserts and I sketched Rosemary sketching the desserts. Had more of us been there, it would have been a conga line of sketchers! Which leads to the topic of this blog. I live at the beach, or 1-1/2 mile from the beach, if you're gonna be technical. the weather is . . . changeable. we can have an inch of snow, and 5 miles inland, they are nestled in 9" of fluffy white. Essentially, our weather is different. Now, my Mom was a charge nurse in my home-town hospital. She would tell stories of how it would be raining cats and dogs on one side of the hospital, and sunny on the other. This, from a hospital that took up one city block. But, I've never seen the weather variations we have here. Today, we had a fog advisory. Of the two routes north to MIlford, one skirts the beach communities. And when there's fog, it is pea-soup fog. The other is a little further inland, and boasts more rain. So, figuring rain was easier to deal with than fog-and-rain, you know what I chose. What I failed to hear was the catch-all phrase "possibly heavy at times." Every time it rains, it's always "possibly heavy at times." Snow (possibly heavy at times). Rain (possibly heavy at times). Showers (possibly heavy at times). Fog (possibly heavy at times). On any given day, the weather forecast can read "sunny, with a chance of showers, possibly heavy at times." And THAT just covers the waterfront, it you know what I mean. When I returned home, our rain gauges showed a total of a whole TENTH of an inch of rain. And, I KNOW I drove through at least an inch downfall in the two hours I was on the road. At least I had my trusty bumpershoot and rain jacket with me. This circles back to the Mispillion Art League -- there is some "possibly heavy at times" art in this Spring Show -- not just paintings, but jewelry, carvings and other three-dimensional work. It's worth the trip if you're in the area. And, there's always a lot to do, and some great places to eat and get coffee! Mispillion Art League is at 5 North Walnut Street, Milford, DE 19963 -- www.MispillionArts.org. Check their web-site for hours, directions and other activities! Growing up I used to hear my elders speak of time as fleeting, as unknown, as being too short, or as not having enough of it. I could not fathom what they were talking about! Watching the hands move on a clock, the seconds and minutes ticked by at the same rate for everyone, didn't they? So what was the fuss? I stopped clock-watching many years ago. Yes, I do still use timepieces to track hours and mnutes, but I don't look at time the same way as I used to. Time is still measured by minutes and seconds, days, weeks, seasons. But my attitude towards time has changed. My day is no longer controlled by a schedule -- by being to work at a certain time, having assignments done by a certain time, meetings, laundry, cleaning, yardwork, luncheons, social activites, and scheduled maintenance controlled by the calendar and clock. Yes, I still use a calendar to schedule appointments, plan events, provide an umbrella structure to my time, but it has almost become an after-thought, rather than the controlling influence in my life. I seem to have entered more fully into that artistic free-fall where time fades away and the present moment is all that there is. Artists are very familiar with the feeling, as are writers, inventors, scientists, musicians and mathematicians. We become so immersed in the doing that we lose track of time. Suddenly, it's hours later, and we do not have the measured tick-tock to mark how time has passed. It happens, too, when reading, writing, watching television, listening to music. The concept of time is individually suspended; the passage of time is not noted. Such was yesterday. I find time "flying," particularly in the studio. There, it is so easy to become right-brained, letting the colors flow and merge, structures take shape and form emerge. This "out-of-time" experience continued all day, punctuated by the need to eat, drink tea, tend the fireplace. But what really happened was this: I was so "out-of-time" I forgot to write this blog. Hence, a day late. On a cellular level we are regulated by a circadian rhythm. On a mental level, however, it's more of a bossa-nova rhythm, where anything can happen -- stops, tempo changes, rhyme. The regulator clock switches to reggae, hip-hop, or full-out birdsong. And, all of a sudden, there's a surprise! Beethoven!!! I truly think that removing the regulation of time has allowed me to be more creative. Let me know your thoughts! After much cajoling from my friends and husband, I bit the proverbial bullet and bought a Real, Genuine, Professional Artist's Studio Easel. Adjustable, solid birch, tall mast, and a tray for all kinds of accessories. Yep, Morgan the Artiste has entered the big time! This all came about as a result of the continual questions, "Are you going to paint bigger?" My current easel is designed for plein air -- portable, three folding legs, lightweight. I have used it in the Studio Annex (second floor bathroom) surrounded by plastic curtains and sheets, but it was not all that sturdy. I think I could butcher a hippopotamus on this one, if I were in the mood for hippo, or had access to one, or even would consider killing and eating one. The point is, this is One Sturdy Easel! The Saga of the Easel began several weeks ago, when I decided to place the order. I had researched various easels, made my decision, placed the order, and waited (anxiously, I might add) for the Arrival of the Blessed Easel. It shipped on Feb 26. And I waited. And waited. It was like waiting for Christmas morning and birthday, all rolled into one. I tried so hard not to get too excited, and it was really tough! I sort of half-expected it to be delivered that Friday, well, HOPED is probably a better word. But, it was slated for delivery on Monday, March 3. Remember March 3? Remember the rain/sleet/ice/snow? We had a state of emergency, here in Delaware, and the UPS trucks were't delivering. (Oh, agony! I have to WAIT!) But, Tuesday's shipping info showed it Out For Delivery! (Oh, Whoopee!) after spending anxious hours at the door, I finally retreated, with the imprint of venetian blinds furrowed across my face, and the realization that I would not get the easel. March 5 rolled around; oh, dear, more snow. Delivery postponed, yet again. But WAIT!! There's a NEW message!! "Damaged in transit. Returned to sender." Heart-fallen, I sadly returned to my snow shovel. At least IT wanted me! There was just one teensie little problem. The single sheet of assembly instructions was written by one of those 10,000 angels who reside on the head of a pin. But, I persevered and figured everything out. It's just . . . I had these parts left over. And I couldn't figure out where these 3 extra washers went, or this other little doodad was inserted. So, I just called the vendor. Made sense. I had just spent 2 hours on Some Assembly Required, and had parts left over, and SEVERAL suggestions about the quality and legibility of the assembly instructions! First comment, "Oh, yes. The easel was returned in a LOT of pieces. Can I send you the sheets of instructions I just found on the computer?" So, now all I have to do is decipher the pictograms of the original instructions and compare it to the emailed instructions (which, by the bye, are super clear and easy to follow). Or I can just put the spare parts in a little baggie in the "spare parts drawer," and paint. I'm going to paint. In 5 years, this will all seem part of the hilarious adventure called "The Easel Has Landed." But for right now, my brain hurts. I predict there's gonna be a whole lot of wailing and gnashing of teeth tomorrow, as our work force heads off to another week of labor, an hour early. And it won't end there. It will reoccur next week, and the week after that, and the week after that. Until some bureaucraticly-set date in October, when we leave the FINALLLY-accustomed bliss of Daylight Savings Time and return to our old and comfortable Standard Time. The problem is that Standard Time is no longer standard, nor is it comfortable. We spend eight months a year on DST, and only 4 on Standard. Seems to me it would be a lot simpler if we adopted DST as a norm, and simply started everything an hour later when the days grow shorter. And there would be no need to remember to set the clocks ahead or back, or trying to figure out what time it really is. Actually, neither time works well for me. I seem to find myself in a perpetual "tummy time," getting hungry and tired in a circadian rhythm that is not controlled by clocks. Having cats help. I recently changed a Facebook 'job title" to cat herder. In fact, one cannot herd cats. One simply accomodates them as a staff member, catering to their needs and whims. They come when called, if they are in the mood. They find reasons to tear through the house at times when the clock indicates all should be asleep. They do, essentially, what they want, when they want, and they eat and play and nap on "tummy time." Guess I'm turning into a cat. Except for patience. Last week I ordered an easel. A real, genuine, artist's studio easel. It came by UPS, bless them. Now, in five years this will be funny as the dickens, but not this week. I was excited. I was impatient. I was expectant. I was nervous. I constantly scanned the tracking of the package to see exactly when this Blessed Artist's Studio Easel would grace my doorstep. Oh, did I mention we had "weather"? Seriously. Snow. Rain. Sleet. Snow. Salt trucks. State-wide snow emergency warnings. Resultiing in -- trucks that did not roll and unforseen weather delays, and, finally, "damaged in shipment." After a week of waiting anxiously for the easel to arrive, it was sent back to the shipper. A replacement should be here late in the week. I am no longer impatient. I am no longer nervous. I am too tired to think about it, partially because I'm still on tummy time and the clocks aren't. The weather is changing. Today in the 60's, snow tonight, preceded by rain, freezing rain, sleet and DelDot trucks. Tomorrow is definitely a day to stay home and putter in the studio-io. I find myself continually drawn back to bird houses. Specifically, there is one particular birdhouse I photographed over 15 years ago in a back yard in Bethany Beach, DE. Those of you who are far away may not realize that Bethany Beach is a rather small community in the off-season. But during the summer, the population swells to traffic jam proportions. The ocean does that to people. Anyway, Bethany, being such a small community has uncurbed alleys. My husband and I were exploring one such quiet passageway, and saw this picturesque back yard with an amazing birdhouse. It was a two-storey affair, with a triple-layer roof. This birdhouse has featured in over 20 paintings. Something about it I find so unique! Someone took the time to construct a sturdy home for whatever passing birds might want to nest there. Many species have very distinctive houses -- wrens, bluebirds, purple martins. This particular house was not built for a specific bird, just any bird that found it comfortable. I find myself remembering the starlings that built in an old purple martin house in our back yard. I would hear them squawking and clattering for hours. "No, dear, the sofa goes THERE! I think I prefer a south entrance -- we're moving! This straw just doesn't match the drapes -- it's outta here!" You get the jist. Wind, weather, and one too many nor'easters have taken their toll. We will retire that bird house this year. Out trees are now large enough for the birds to nest in, so the martin house will not be missed. But we will miss the annual spring decorating and the happy noises of our feathered neighbors raising their families. I have not seen that alley birdhouse for years. There is an indelible memory etched now in my mind. And like many memories, it changes with time. Sometimes it's called "artistic license." Other times it's simply selective memory. Nice that we get to select the memories we keep! It has been an interesting week, working on the new web-site. We've tweaked the menu, altered the tree, and gathered photos of art work. So far, so good. Mixed media, check. Oil pastels, check. Sketchbooks, also check. Watercolors, minimal check; only a small number of photos from close to seven years of painting. So, where were the photos? Checked every single thumb-drive I could lay my hands on. No luck. I've got the photos in the album, so I KNOW the electronic record is Around Here Somewhere!! After searching for two days, I finally located the storage device with my watercolor photos -- a 3-1/2" floppy disc. Right after the Elation of having found the lost lambs came the Realization. What computer today takes 3-1/4" floppy discs? With a little help from my friends, I located a plug and play drive, with the obligatory USB port. E, Voila! I still couldn't access the photos. Turns out, the program I used to store the photos was from Kodak, who no longer offers support. Looked some more, and found the original disc with the download for the program. I thought I was in business, finally, finally. That idea pooped out, too, after trying to load the disc on two different computers. It seems the program was 9 years old, and the supporting technology and programs have advanced so far that the original program simply had the "vapors" and refused to load. So, having spent almost a week seeking a solution, I'm back to square one, where I simply scan the photos into the computer, save them on SEVERAL devices as j-pegs, and hope the technology gods allow me the luxury of posting a few on those errant photos on the web-site. Had I simply bowed to the Obvious Conclusion, I would have scanned them at the first sign of lost technology and saved myself a week. Oh, well. I do have 20/20 hindsight. This was all unintentional . . . This wasn't what I had in mind -- blogging and web sites and such. I was just going to stay in my studio-io and paint. But, you see, painting wasn't originally in the cards, either. Growing up with parents who supported families through the Great Depression, i was actively discouraged from any kind of art because "you can't make a living at it." So I repressed my desire to draw and paint, but it finally got the better of me. So, here I am -- Morgan Golladay, Fine Artist. And, I'm blogging about it. I swear, I'm almost giddy-headed about it! Not to the point of being addle-pated, you understand, but just a wee bit giddy. Now, admitedly, a lot of that is cultural. See, I grew up with party lines, a 4 channel black and white tv, and one car in the family. So blogging, and all of the associated technology that led up to blogging, is part of that huge learning curve I've gone through. 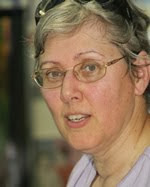 This blog is associated with my web-site, but will stray into other areas. Opinions, poetry and weather reports will bump elbows with cat stories and art discussions. This of it as a smorgasbord. Artists are creative people; goes with the territory. The only way to have a good idea is to have lots of ideas. and many of the creative ideas we have give birth to other ideas. Art and poetry are two different ways of creating mind pictures of these ideas. So, I'm gonna fasten my seat belt. It's promising to be an ineresting ride!